Starring Judi Dench, Ali Fazal, Michael Gambon, Olivia Williams, Eddie Izzard, Simon Callow, Tim Pigott-Smith, Adeel Akhtar, Fenella Woolgar, Julian Wadham and Deano Bugatti. Distributed by Focus Features. 112 minutes. Rated PG-13. Have you ever seen those cute YouTube videos where two very mismatched animals – let’s say a lion cub and a baby elephant – who are unaware of their differences, just rapturously happy in their own company? They roll around, playing. They are adorable together for a while, but eventually you start to think: Okay, what now? Victoria and Abdul is something like that; a sweet, heartwarming look at a very odd friendship, but eventually their relationship is more interesting than the story being told about it. Which is in no way to say that Victoria and Abdul is a bad or unworthy movie. Quite to the contrary, it is a wonderfully filmed, smart, funny, literate period piece. It is stylishly directed by Stephen Frears. As for the acting, well, it’s Dame Judi Dench as Queen Victoria. It doesn’t get better than that. It’s just that once the situation is set up, there’s not all that much there there. Why are they telling this story? It’s certainly not poorly done, or boring, it’s just very slight. Dench plays the widowed Queen late in her life here. (She had previously played the Queen in the 1997 film Mrs. Brown.) Legend has it that Queen Victoria was never an overly upbeat person, but at this point in her life she was particularly miserable – sick, bored, going through the motions, being trotted out for regular state affairs while those around her were basically just counting down the days until she dies. It was British feudalism which eventually connects her with Abdul (Fazal). Fazal was an Indian carpet salesman who is picked rather randomly – he is tall and fits the outfit – to travel to England to present a ceremonial coin to the Queen, and then to be returned to his home and rather undistinguished life. They travel to England. At the banquet, they are not allowed to speak, they are not allowed to look at the Queen, they must just offer her the coin and leave, quickly. However, Abdul does speak, and his bravery (and his handsomeness) intrigue the elderly Queen. She insists that they stay at the castle, turning Abdul into her servant and her best friend, while the entire castle is agog by the scandal of the Queen spending so much time with an Indian servant. And Mohammed just wants to go home already. And that is pretty much it. They fall in love, in a totally non-romantic way, becoming best friends and inseparable. Abdul’s upbeat and optimistic manner fascinates the Queen, which gives her a new lease on life. Abdul, frankly, seems way too excited to become a servant, even for a Queen. In the meantime, her son (Eddie Izzard) schemes to get rid of the interloper. The script is smart and very funny, the acting is terrific, but the actual story does not quite live up to the talent involved. 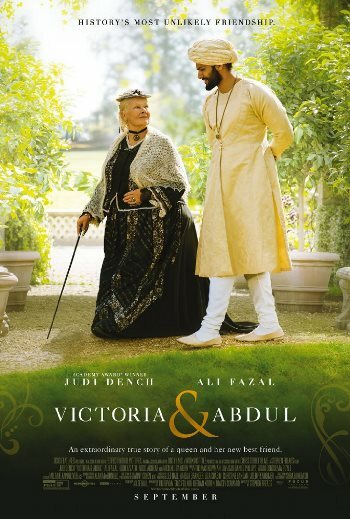 Tags: Adeel Akhtar, Ali Fazal, Deano Bugatti, Eddie Izzard, England, Fenella Woolgar, india, Jay S. Jacobs, Judi Dench, Julian Wadham, Lee Hall, Michael Gambon, movie review, Mrs. Brown, Olivia Williams, PopEntertainment.com, Queen Victoria, Simon Callow, Stephen Frears, Tim Pigott-Smith, Victoria & Abdul. Bookmark the permalink.